What Kind of Elf or Fae Are You? WHAT KIND OF ELF, FAE, OR OTHERKIN ARE YOU? WHAT IS YOUR TRIBE? 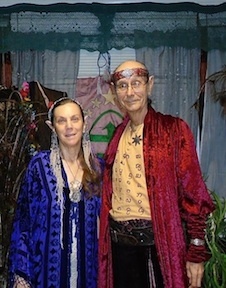 These elves have been pursuing the Elven Path since 1975 and over that time we've had numerous sisters and brothers write to us asking if we could help them understand what sort of elf or fae they might be. And many also wish to know what is their Elfae or Otherkin tribe and what they are like as a magical people? You may know if you are an elf, faerie, or otherkin but now we've created a questionnaire in order to help us and you create a narrative about your specific people and your clan, their personal characteristics, magic, relationship to Nature, and interests. This is our gift to you, which we think will be a bit of fun for both of us. Now, we expect that most of the folks who will take this questionnaire will be elves, pixies, brownies, faeries or other fae but we have also set it up to help Therians and Otherkin of various sorts, since we occasionally get inquiries from them as well. This is not an automatic response questionnaire. When you are done you will not get some already formulated reply. We need you to send your answers to the questions to our email address at silverelves@live.com and we will examine what you have said and do our best to aid you in this quest. You may wish to copy and paste the questionnaire into an email to us and add your answers there. In responding to these questions, we suggest that you do so mainly in an instinctive and intuitive way. Trust your feelings. Don't second-guess yours'elf and don't mull things over long. Your first inclination to respond a particular way is most likely the most accurate response. Don't over think it. And, in as much as possible, be succinct in your answers. We will attempt to get back to you as quickly as we are able but depending on the number or requests this could take a couple of weeks or even a month. Good luck, we look forward to hearing from you, and many Elfin Blessings. Quick announcement! While we are still enjoying writing these narratives and look forward to your participation, we are happy to announce that we have published in March 2019, ELF TRIBES: The Silver Elves Guide for Finding Your Magical Kind and Kin and its companion book FAERIE, FAE AND OTHERKIN: The Silver Elves Guide for Finding Your Magical Kind and Kin. You may click on these book links and read all about them and excerpts from each book, including some samples of the over 300 tribe narratives contained in these books. These books contain only the narratives we have written for people filling out this questionnaire and no personal names are associated with them in the publication. In fact, we do not keep people's names, so your questionnaire is completely confidential. What Kind of Elf or Other Fae Are You? 1. What two or three colors do you relate to most? 2. What symbol or symbols represent your tribe? Please describe. 3. Does your tribe practice body modification, such as tattoos, piercings, scarifications, etc. Please explain. 4. If you could live anywhere you desired would you live on or near the ...? a. Ocean, River or Lake? Which one? In the water? On (boat)? Near? b. Desert, Rocky desert or Sandy low desert? c. Plains or Savanna? Hilly or Flat? Tundra and Icy? Marsh? Swamp? Fen? d. Mountains? Rocky, Woody, Waterfalls, Caves or Caverns? Valley or Hillside? e. Forest? Deep or near civilization? Rainforest, Jungle or Cool? f. City? Small or Large? g. Travel constantly moving from place to place? 5. Do you have a favorite type of tree? What is it? 6. Do you have a favorite type of flower? What is it? 7. Do you have a favorite type of plant? What is it? 8. Do you have a favorite crystal or gem? What is it? 9. Do you have a totem animal/s? If so what? 10. What sort of magic do you relate to most (pick the top two or three)? 11. Did your people originate from the earth or some other star system? Please explain. 12. Do you most feel akin to being part of a ...? 13. When I think of mys'elf I feel most like an ...? j. Therian: were-wolf? were-leopard? kitsune? other? r. Angel? Deva? Shining One? Valkyrie? r. Something else? please name. 14. Does your group/clan/tribe have a flag, banner, gonfalon, crest, escrutcheon? And what is on it? a. Does it have an animal? What animal? Is it laying down? Standing? Rearing up? Running? b. Does it have weapons on it? Bow and arrows? Swords or Knives? Lance? Staff? Axe? Blowdart? Club, mace or morningstar? Other? c. Does it have some plant, vine or flower on it? Which ones? d. Does it have an elemental motif? Fire? Water? Wind? Rock? e. Does it have a planet? Star or Stars? Moon? Sun? f. What color is the background? 15. What ancient peoples do your clan most resemble? d. Aboriginal folk of Australia. e. Ancient Polynesian folk, Moari etc..
f. Ancient African tribal folk. g. First Nations tribe of the Americas. i. Pict-Sidhe of Scotland, Wales or Cornwall, England. m. Ancient Arabic, Semitic folk. n. Ancient Mongols, Chinese or Japanese folk. o. Eskimo? Siberian reindeer folk? p. Ancient Eastern: Danavas? Gandharvas? Apsaras? 16. What is your people's relationship to mankind? a. Trying to help and enlighten them? b. Trying to hide and stay out of their way? c. Hoping to get revenge on them for the wickedness they have done to us? 17. What fictional elf or faerie folk are your people most like? c. in The Lord of the Rings. d. in Freda Warrington's Elfland. e. in Marie Brennan's Onyx Court Series. f. The Vulcans or Romulans of Star Trek. j. in Emma Bull's War for the Oaks. k. in Charles DeLint's books. p. Graham Joyce's Some Kind of Fairy Tale. 18. Are people outside your clan more likely to call your people ...? b. The People of Peace. 19. What do your people think is the most important thing in life? 20. What sort of government do your people have? a. Anarchy, we have no organization and just hang out together. b. Consensus, we have to agree on everything or we break up into smaller groups that do agree. c. Democracy, we vote on everything, majority rules. d. Republic, we vote on representatives who vote on everything and majority rules. e. Queendom, our queen and her counselors make all the important decisions. f. Kingdom, our king and his counselors make all the important decisions. g. Theocracy, our holiest people make all the decisions based upon what they think the Shining Ones want. 21. Do your people sometimes wear fur? 22. Do your people believe in gods? If so, what gods or pantheon do they interact with, and please explain? 23. Do your people have magic treasures? If so, what are they? 24. Who are your elven, fae, or otherkin heroes or role models, either real or imaginary?